The perfect size for poi, these "no. 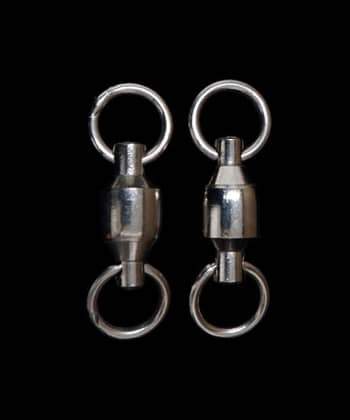 8" swivels are ~10mm wide and custom made for flowtoys with 8mm ID welded rings and pre-lubricated ball bearings. These have a 300lb breaking strength and were the best of all we tested. My bearings are no longer spinning smoothly! Fear not, they may just need a few drops of oil, but they probably have some dirt or thickened lubricant inside, and need to be cleaned and re-lubricated. The proper way: The first step is to rinse dirt and old oils out of your bearings with kerosene or mineral spirits, then rinse them off with 99% isopropyl alcohol. Use a small cap to hold just enough to soak the swivels and shake/spin them out a few times until they feel smooth/grit free. Lubricate your clean and dry bearings with a drop or two of thin machine oil or bearing lube like you would find for skates, sewing machines, or hair clippers. Spin and wipe clean with tissue. The quick and easy way - might not get them quite as clean, but does the trick: Use Bones Speed Cream, sewing machine oil, or "Tri-Flow" bicycle lubricant - Bones is best, sewing machine oil is good, tri-flow is fine. Drop enough in the bearings to rinse out the old stuff/dirt, spin and repeat until they feel smooth. Wipe dry with rags/tissue. DO NOT use WD-40, or anything like it! WD-40 and other cheaper lubricants leave behind a film that collects dirt and dust, and makes your bearings sticky and gritty. The grit will ruin your swivels. These lubricants also contain toxic substances specifically for displacing water (Water Displacement-40), which in not necessary for poi swivels.